The numbers and types of Variants have proven almost unending. Leroy Thompson, author of the fine book "Commando Dagger" told me he thought when he finished his book it covered every possible type of Commando knife. Since seeing my collection of knives, he said he was astounded at the diversity. It seems as though new ones pop up every week if not every day. There are even models within models like with the Fatman knives shown here. Below: I could not resist buying this 7/8th size Fatman. It is 10 1/4 inches overall with a 6 inch blade. An interesting thing I discovered is that the handle was hand-chequered using a graver and files. Some of my friends believe it is just a bad knurling job but I stick by my position. Under close inspection one can see how the width of the cuts vary and wiggle about. Some places there are no crosshatching lines at all. The extra large top nut is made with a blind hole and the guard is lightly stamped England. (So Ron this is not another Mason Fake LOL) There are no other marks. The heavy leather sheath fits it perfectly and the chape is formed of silver, whether white brass or Sterling I cannot tell. Peter Mason was said to have once commented that it might have been made for a woman because of the smallish grip. Leroy Thompson said he has seen others this size before. Others think it was shortened as an Agent's dagger. Measurements of the handle suggest it was not a shortened standard Fatman handle. An interesting piece to be sure. Below: Here is another rare Fatman with a smooth handle. It is not just a standard knife with the checkering removed. For some reason it was made this way from day one. In reality the checkering on most First Pattern and Second Pattern knives does not add a lot of gripping. Would the smooth handle be more slippery, perhaps not. I find the slickest grip of all to be the Third Pattern because the ribs reduce the hand's surface contact with the handle. Below: Here is one of the Fatman we have for sale. It is unique in that it has a flat black handle finish, and a heat blued blade. The heavy forged blade is a beautiful peacock blue from the tempering process. It has a std. oval steel guard and a large blackened top nut. The sheath is a flat commercial style which may or may not be a later replacement. The "Fatman" is perhaps one of the best of all the variations on the Second Pattern knives when it comes to ergonomics. Some people call it a “Fatboy” but the name I am most familiar with is “Fatman.” Some controversy surrounds this knife, as with many of the lesser known, and unmarked versions. Many collectors believe they were made by LF&C, Landers, Frary and Clark of New England. 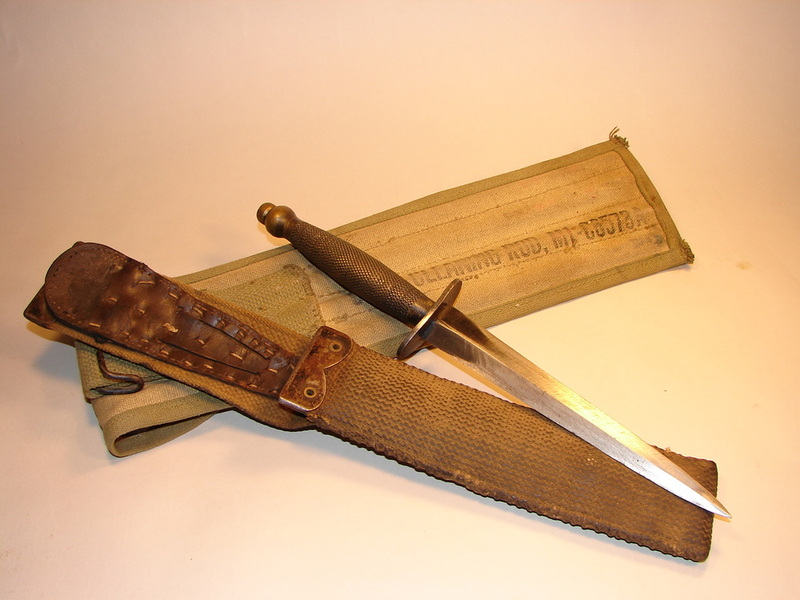 This same company manufactured other military knives including trench knives and the famous O.S.S. Stiletto. Other collectors think the Fatman knives were made in the United Kingdom but I have seen no bulletproof documentation to prove either hypothesis. The subtle (but obvious to the aficionado) difference between a P-2 and a Fatman is in the handle. The handle gripping area is more tubular and does not have the distinctive “Coke™” bottle shape of a P-2. In addition, the knob on the end of the Fatman handle is more bulbous, ie fatter. Many of the examples I have seen also have checkering that is coarser than a P-2, similar to that found on the O.S.S. Stiletto. It appears that the original finish was a black paint of some sort although one example I have has very smooth checkering and no finish. This leads me to question whether the owner objected to the rough texture and sanded it down, thereby smoothing the checkering and removing the finish at the same time. In my opinion, the fat handle gives it a better feel in the hand. Some of the examples I have seen are stamped on the handle with a tiny broad arrow and an inspectors number indicating they were accepted into military stores (inventory). Many of them have no markings and one must assume therefore they were also available as private purchase items. Sometimes you will find the ubiquitous “England” stamp that was required for post-war importation into the USA. 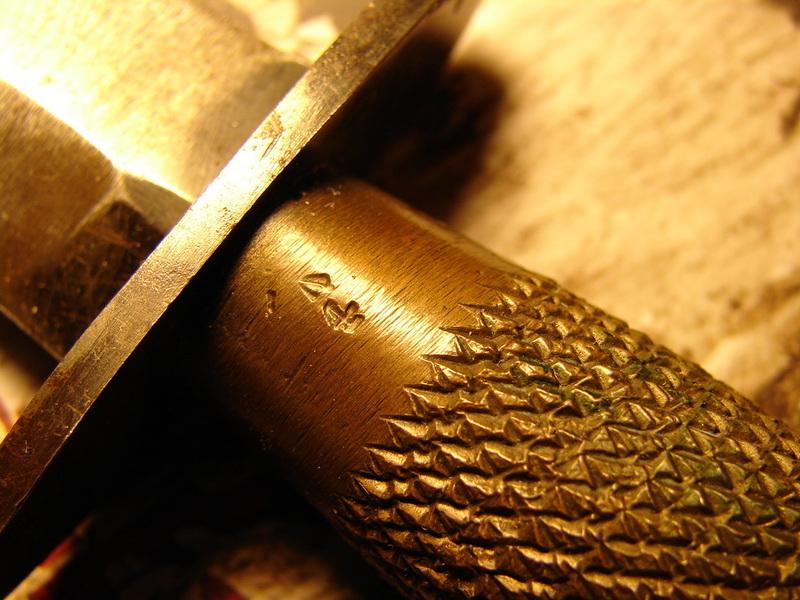 Some of the cross guards have an interesting diamond shaped depression stamped into the bottom for the blade to seat into. I have not seen this on any other British made knives but I have seen it on French made knives. The sheaths are very typical of those used on P-2 and P-3 knives, with one exception. I have illustrated one different sheath fitted with some sort of a white metal chape and no leather tabs. The original owner of the first Fatman that I have chosen to illustrate here. made a unique repair to the sheath in an attempt to ensure that he would not lose his knife. You will note the remnants of the black finish on the handle and very little remaining blackening on the blade,the rest having been removed by sharpening. This knife has been very well taken care of through the past 70 years. 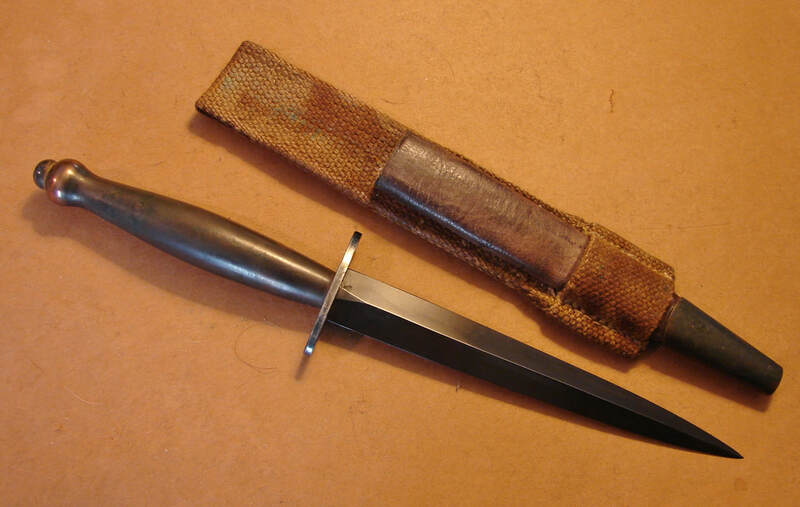 As rare as the Fatman commando knife is, a smooth handled one is much rarer yet. 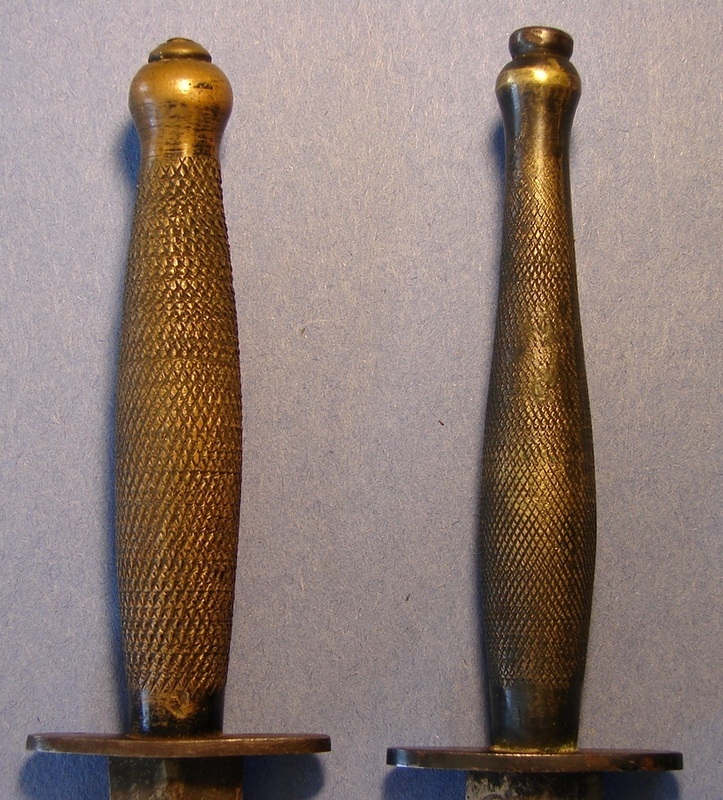 The one shown here at the right appears to have been turned down from a standard knurled one. The question would be whether it was modified before its initial assembly or at some later date (wartime). 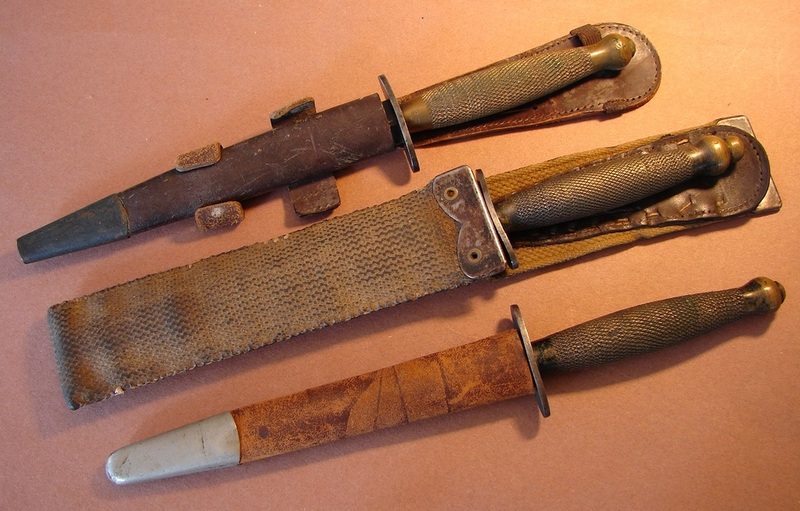 It was not until I had the opportunity to study several of the rarer commando knives that I began to notice the "Fatman" look appearing on other Fairbairn handles. 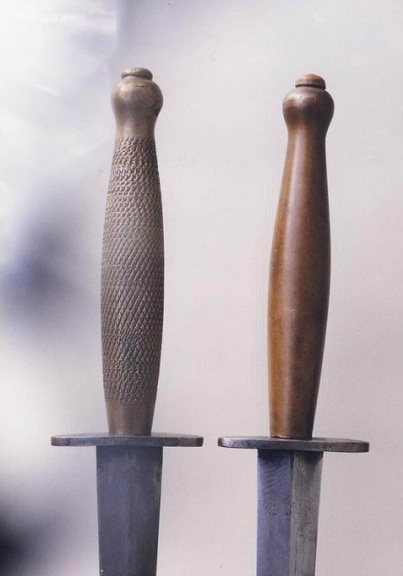 While I do not own the knife on the left it makes for a very striking First Pattern knife with its bulbous pommel. 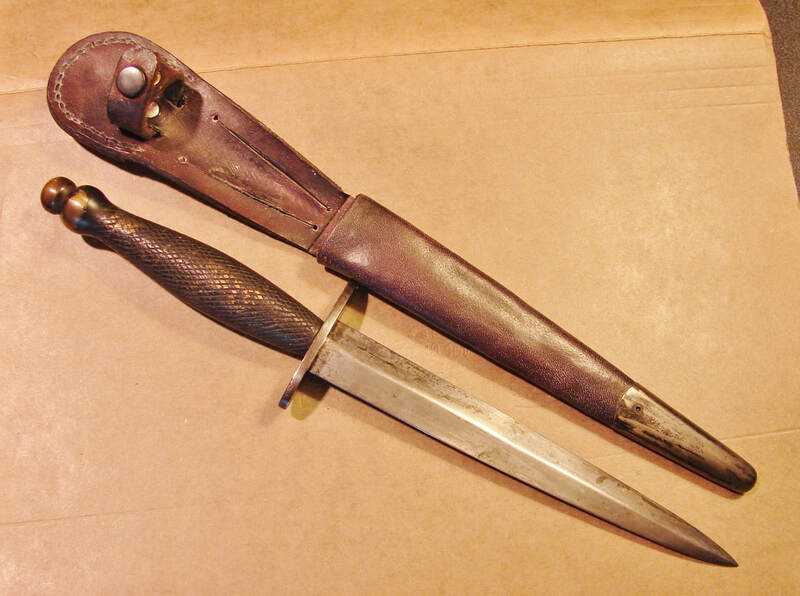 The one on the right is not mine either but one like that which I refer to as my Lovat Dagger. Below: Photos of a Fatman loaned to us by a visitor to the site. It is an extremely nice example and now the owner is looking for a good contemporary sheath for it. Shown below these two images are two O.S.S. knives and the Fatman. Thanks Brandon for the images, nice collection.